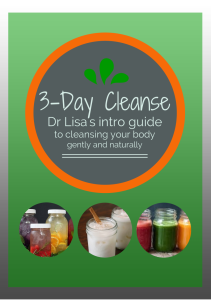 Hurray for your decision to check out Dr Lisa’s 3-Day Cleanse! Use the Grocery List to gather ALL of your ingredients ahead of time. That way, you’ll be prepared and you won’t be scrambling for something to eat after a long day at work. Go for organic if you can. The farmers market is a great place to find really fresh, vine-ripened fruits and vegetables, but do what’s easy for you. If you’re a heavy caffeine consumer, ease off (as in cut back) a few days before. You can still have green tea on the cleanse but if you’re a multiple-times-per-day kind of person, keep in mind that your body WILL have a better response without being that over-stimulated. Some people like to do the first day of a cleanse when they don’t have much going on, and can be near the bathroom, as you will have an increase in elimination. And if you can, disengage from stimulation such as TV, video games, constantly being on your iPad, etc. The more you can just BE, rather than do, the better results you’ll have. Relax and let go. . . Most importantly, have FUN! Start with the mindset that you’re just checking out the whole cleansing concept. Remember, this isn’t an intense full-on Purification Program. It’s intended to give your body a break and see if you’d someday be up for an even deeper detox routine.